If that gorgeous bouquet doesn't put a smile on your face this Monday morning, I can't imagine what else would! It's just so joyful and bright, I couldn't resist! I dragged John with me to the office on Friday morning, where he spent a few hours dismantling desks and playing my handsome handyman–in a navy blue suit and tie, no less! I figured we'd head to dinner early since we'd had quite a long week, but when 6pm rolled around, I finally found him having cocktails with friends at their turn of the century apartment in Noe Valley! I hightailed it over for Mississippi Mules and Marcona almonds, and after a few rounds and some gorgeous recordings on Bryndon's Victrola, we made our way to a late dinner. Hand in hand, we grabbed gelato from Holy Gelato! (raspberry for me, coconut for John) and headed home. We slept in on Saturday, relishing a morning free of commitments; when we finally woke up, we threw on some clothes and headed out to run a few errands and grab breakfast at Beachside, a darling little café just a few blocks from (wouldn't you have guessed) the beach! After a cheddar and herb scramble for me and Eggs Florentine for John, we headed home and curled up with the season 5 finale of Mad Men, relishing time together since we've both been so busy recently. Finally John pulled out his guitar and I dug into my inbox, and before I knew it, his Saturday night shift had rolled around! We had a little late afternoon picnic before John left me to my own devices, and while I'd planned to savor the sunshine in Golden Gate Park with a good book, I was still at my computer two hours later struggling with code I just couldn't make right! I hate to admit defeat, but finally I poured myself a glass of lemonade and swore to reapply myself–another time. I whipped up a Gruyère grilled cheese and ate all the raspberries in the fridge before drawing a hot bath and taking my book in with me–talk about a perfect Saturday night! We were up at a more reasonable hour on Sunday morning, and found the streets packed with fellow brunchers. John and I managed to snag an outdoor table in the shade, ordered our favorite breakfasts (tofu veggie scramble for John, poached eggs for me) and enjoyed this unseasonably beautiful San Francisco summer. We strolled home and indulged in an episode or two of Frasier before getting down to work–me at the computer, John at the guitar. Soon it was back to work for my sweetheart, while I hustled to squeeze in yoga practice, a shower and a blow dry. I met a dear friend for cocktails (John's, of course), and we ended up spending the whole evening sipping, eating and gossiping–it's such a shame she lives in New York! We finally made it home late Sunday night, exhausted and almost ready for Monday morning. 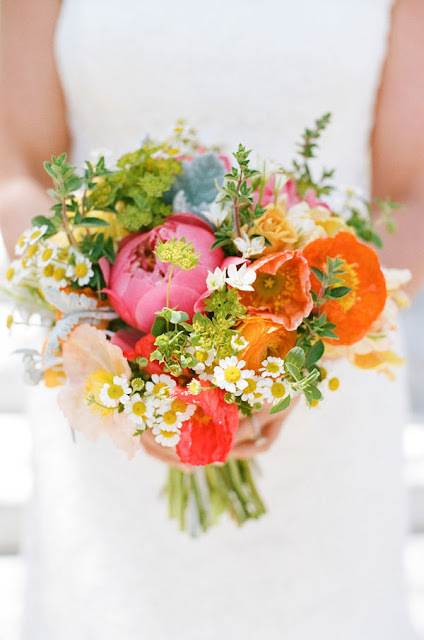 Image by Picotte Weddings, bouquet by Holly Flora. Sounds like a wonderful weekend, food, rest, books :) Sigh. Love this bouquet...the little daisies (aster?) are such a sweet touch! Ahhh lovely Lena! This reminds me that next time I'm up there I have to go to brunch in the city! So many good spots! Every time I read about your weekends I think, "When are we gonna have a Saturday dinner together?!" Soon. Very soon! Ah what a wonderful weekend Lena! We kicked off the weekend with a get-together at our new apartment with some of Ethan's army buddies. Amazingly, the leftover pizza held us over til Sunday at 3pm haha. Absolutely, gorgeous wedding bouquet!! Love all the colors...it says celebrate love and life! Wait are you telling me you didnt have Indian food this weekend?! I dont believe it. That bouquet is perfection, holy wow! Scrumptious brunch out not once, but twice? The best. I was so busy and wish I could've relaxed....but that's this weekend! i can't believe the season finale didn't get spoiled for you! though nothing significant really went down? what did we do before DVR? Wow, that bouquet is gorgeous! Glad you had such a great weekend! Seriously a perfect bouquet! And i'm am so behind the times and JUST started Mad Men! Sounds like a perfect weekend! Breakfast by the beach sounds perfect!